From Goodreads ~ When your son wakes you up at 3:00am because he wants to watch Caillou, he’s an a-hole. When your daughter outlines every corner of your living room with a purple crayon, she’s an a-hole. When your rug rats purposely decorate the kitchen ceiling with their smoothies, they’re a-holes. So it’s only natural to want to kill them sometimes. Of course, you can’t because you’d go to prison and then you’d really never get to poop alone again. Plus, there’s that whole loving them more than anything in the whole world thing. I'm a childfree (by choice) and I haven't spent a lot of time around children (I've never ever changed a diaper ... and I'm okay with that). I recently read I Want My Epidural Back: Adventures in Mediocre Parenting by this author and enjoyed it so I thought I'd check this one out too. Another holiday? Are you f'ing kidding me? Annnnd this is what my life has turned into. Awesome. I enjoyed the writing style and found it very conversational. The author shares her personal experiences of being a wife and raising her children and includes pictures. I think she would be a hoot to hang out with and have a glass of wine (or two or three) with. As a head's up, there is swearing and adult subject matter. 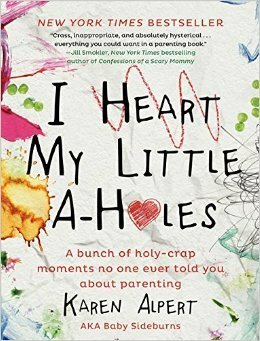 If you are looking for a serious book about being a mother and wife, this isn't it. 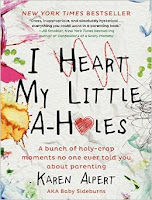 If you are looking for a book you can relate to as a "real" mom and wife, you should check it out ... she exaggerates so please don't take it too seriously.